Safety is a key factor in determining the social climate in any country. Russia is no exception. Quite often, heads of major international companies make decisions on whether or not to open an office in Russia based on how safe and comfortable they feel in the country during their visits. Dmitry Fonarev, President of the National Bodyguard Association (NAST) of Russia, talked to Capital Ideas about Russia’s private security market for VIP visitors. Mr. Fonarev, you witnessed the emergence of private security for Russian and international business representatives. Can you tell us about that? In Russia, the emerging business sector began to understand that there is a need for physical security in the beginning of the 90s. This happened after there was a series of murders in the midst of criminal wars that started to affect big entrepreneurs. At the time, amateur cooperatives were providing security services. Issues of personal security for heads of companies were often resolved by… their drivers who were carrying illegal firearms of baseball bats in the trunks of their cars. Keep in mind that the law that gave people the right to resist violence with firearms under government control was only adopted in May of 1992. Many bodyguards from the 90s paid for their work with their lives. Those who survived gained invaluable practical experience that, with support from the NAST, is turning into a federal law on private security. Gradually, the criminal confrontations of the 90s became a thing of the past. Major security companies started popping up in Russia. The total number of licensed security personnel in Russia is currently over 700,000 people, and there are about 23,000 private security companies. Where did private security personnel for Russian oligarchs come from? Were these former employees of the KGB’s Ninth Directorate? That’s exactly right. There were about 3,000 people working for the Ninth Directorate. During the democratic reforms, almost all of them found themselves working in private security. Big business representatives who were concerned about personal security always had officers from the former Ninth Directorate. Officers from the first department of the legendary directorate were especially valued. They knew a lot and were familiar with many different kinds of situations. Businessmen who invested in former employees of the Ninth Directorate had a big advantage in terms of personal safety, unlike people who relied on regular private security companies. In 1995, it was officers from the former Ninth Directorate that lay the groundwork for the National Association of Bodyguards in Russia. They understood that the experience of the Russian school of personal security should not be wasted. You’re one of the few people in the world Ronald Reagan gave a pair of custom engraved gold cufflinks to. How did you get such an unusual present from the President of the US? In the history of KGB, there have only been two officers that US Presidents paid attention to. One was Vladimir Vinokurov (Moscow, Nixon, 1973), and the other is yours truly (Washington, Reagan, 1988). Cufflinks are an official souvenir of the White House administration. As far as I understand, cufflinks are an item that’s appropriate for situations like this. Of course, landmark visits by heads of state are always prepared for well in advance and resonate widely. If everything goes smoothly, a sense of euphoria grips the organizers, the participants, and everybody else taking part in this historical event. I felt this when I was assigned a job at the gates of the White House in Washington. I did this for the entirety of the visit – a whole three days. No shifts. That is, when Ronald Reagan, along with Soviet and American politicians, came to the White House, I was always there. Of course, colleagues from the US Secret Service were working with me. Or rather, I was working with them. But in three days, they rotated about twelve people. I was there alone with a phone and my gun. There were times when we had to jointly make decisions on the spot, right in front of the White House gates. Things got especially tense before the final evening, during which the song “Moscow Nights” was performed by Van Cliburn himself. That evening, other colleagues from Gorbachev’s private security replaced me so I could get some rest in a designated space. On my way back, someone from the US secret service “accidentally” bumped into me and gave me a blue box, adding that it was from the President. I said ok. But that’s not all. In six months, Reagan’s security team came to Moscow and brought me an official belt with a copper “Secret Service” buckle, which I’ve kept with me for the past twenty years. But really, all of these are pleasant but fairly standard souvenir stories that are common at that level. Many officers from the legendary Ninth Directorate got custom engraved gold watches, golden coins that mean you’re part of one of the royal families in an Arab country, and many other unique souvenirs. Which heads of major international corporations have you provided security services for during their trips to Russia? When the criminal wars stopped and Russian business became more civilized at the end of the 90s, after the default, heads of major corporations that already had offices in Moscow started visiting Russia. This included Microsoft, AMD, Google, Apple, World Bank, Bank of New York, and many other leading brands of the world’s economy. By that time, the NAST in Russia already had a good reputation in the international professional community and our colleagues who worked with security services for different corporations often contacted us with partnership offers. There were other situations that didn’t end well. One of them happened with Bill Gates from Microsoft, when he came to visit us at the end of the 90s. The head of the company’s Moscow office was tasked with providing him with security services. After choosing what seemed to be the best bodyguards from an ad in the newspaper, the Moscow office signed a contract with a big company in the city. But… after just 4 hours, Bill refused to work with their agents. This group of security personnel were so unprofessional that he made it a point to refuse their services. For his next visit, Microsoft contacted our partners – the Danish security company AS, who then reached out to us. This is how I met Bill Gates, and we quickly became friends. Another celebrity I’ve worked with was Henry Kissinger. I remember him as a person who never sleeps. Are there differences in terms of providing security for Russian entrepreneurs versus heads of international corporations? Yes, there are significant differences between our approaches, which are known as different schools. The main difference is the organizational structure and the distribution of responsibilities between bodyguards. American corporations, which is who the Europeans and Israelis copy, use the team leader principle. The team leader appoints a guard responsible for the security of a specific person. The corporation allocates a lot of funding for this purpose. The thing is that corporations don’t have a group of personal bodyguards when the person is at home. This means that, in the US, this person doesn’t have bodyguards, and is accompanied by this team leader when necessary. But if the person goes somewhere, like Russia, the team leader creates a security plan and draws up a budget for the trip, which includes funding for local support. But this American approach doesn’t work well in practice in Russia. It’s different here. There is a boss and bodyguards that form a single group working security posts. Each bodyguard is responsible for their post. 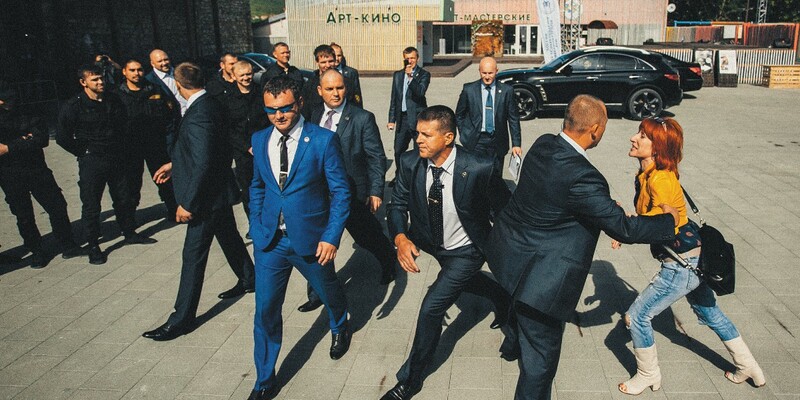 So there are differences in training, requirements, and standards for Russian bodyguards. Why is it that members of the National Association of Bodyguards are usually invited to provide security for foreign VIP visitors? In the mid-90s, the NAST in Russia became a trusted name on the security market. Since 2004, the association has had our own club of bodyguards, which has been branded the Grey Shadow’s bodyguard club by our long-time expat friends. The club is a structure that has personnel, resources, and options to access them immediately. Over the past 15 years, the average salary for an armed bodyguard who speaks a foreign language amounted to somewhere between 35 and 45 euros. It depends on the work conditions. The NAST is not a company or a business entity, but a national organization that brings together professional security specialists who have their own philosophy, ethics code, and ways of helping each other. PreviousPrevious post:Here, anybodycan outplay you…NextNext post:Have you anything to say about your treatment from a discrimination or harrassment perspective?